Mondays, 7.45 – 9.45 pm, at Manvers Street Baptist Church Hall, Bath, BA1 1JW. 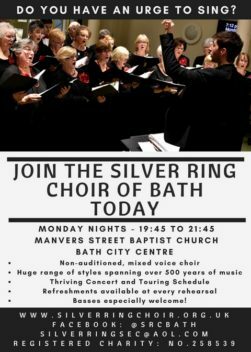 Come along to a rehearsal one evening! You will be most welcome. The Choir subscription is reviewed annually and is currently £50 per quarter (or £200 per year). Some bursaries are available.